A former member of Glynwood’s Advisory Council, Megan has joined the organization’s full-time staff to direct region‐wide collaborations and trainings with and for regional food and farming professionals. In this role, Megan is instrumental in continuing and expanding Glynwood’s niche as a convener and creative producer of efforts that will ensure the Hudson Valley is a region defined by food. Central themes of her work at Glynwood include increasing the viability of farming in the Hudson Valley and establishing a food culture that is closely tied to agriculture. 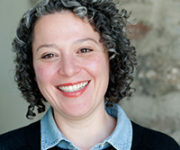 She is also a primary collaborator in increasing the use of Glynwood’s mission‐related facility by planning and executing convenings and trainings onsite that provide networking and learning opportunities to a range of professionals across topics that will strengthen the regional food system. Previously, Megan was Director of Strategic Initiatives and Community Outreach for Slow Food USA. She holds an MA degree in Anthropology from SOAS, University of London, where her research focused on seed exchange, first-generation women farmers and food heritage. Megan continues her social science research on food and farming as a PhD student at the University of Exeter’s Center for Rural Policy Research. Megan has a broad range of experience in food and agriculture, including ten years as a restaurant professional, running one of the Midwest’s largest and most successful farmers markets, and an apprenticeship at Bread & Puppet Theatre Farm.